I found these amazing vintage curtains at a thrift store awhile back and couldn’t pass them up. I fell in love with the print and colors. I was a little scared that using them would end up like a bad remake of the Sound of Music, and well, it did kinda end up that way, but I love it anyways. I wasn’t confident enough to make myself something out of it, but I thought that my daughter could pull it off better than I could. The pattern that I used was from the burda magazine #152. 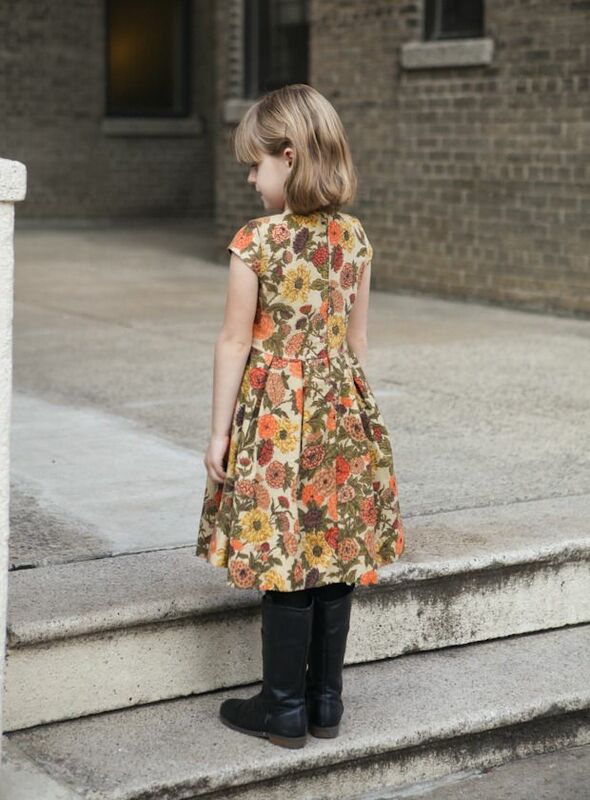 I love that it’s such a classic little girls dress. I made it up once before in a ponte which worked great too. I made a few changes this time around. I lined the entire dress with a brown cotton lawn. I liked that it made it a little nicer and also that it added a bit more fullness to the skirt. I also rotated out the waist darts this. Because honestly, little girls don’t need darts and seeing them on a little dress weirds me out a bit. My daughter is obsessed with the dress. I love that the fabric is definitely winter and fall appropriate. It was perfect for both Thanksgiving and Christmas parties (yes, I’ve been sitting on these photos for almost two months). Now I’ve just got to figure out what to do with the rest of the curtains. I probably still have four yards. I am thinking that maybe a duffle bag or backpack might be cool. Very pretty dress. Even prettier model. This dress is gorgeous! I love the fabric–never would have known it used to be a curtain ! I almost never sew kid clothing, but I would have been weirded out by darts, too! This fabric was an excellent find, and the dress really turned out. And it certainly looks like she enjoys wearing it! This is gorgeous, love the fabric and the pattern. And I am inspired – we bought a new house and I removed all of the window coverings put up by the (elderly) former owner. Gorgeous, good quality fabrics but not my style for windows. Never thought of reusing for dresses, and backpacks! Duffel bags! Brilliant!! I like the dress very much in this frabric. Genius ! trés, trés jolie ! What a find, that fabric is so pretty. Your daughter looks adorable in that dress. You can tell she loves wearing it. Great fabric. Your daughte knows exactly what to do in front of the camera. BTW, I posted a very good review of the Sutton blouse on my blog. I was so pleased with it! this fabric is wonderful! 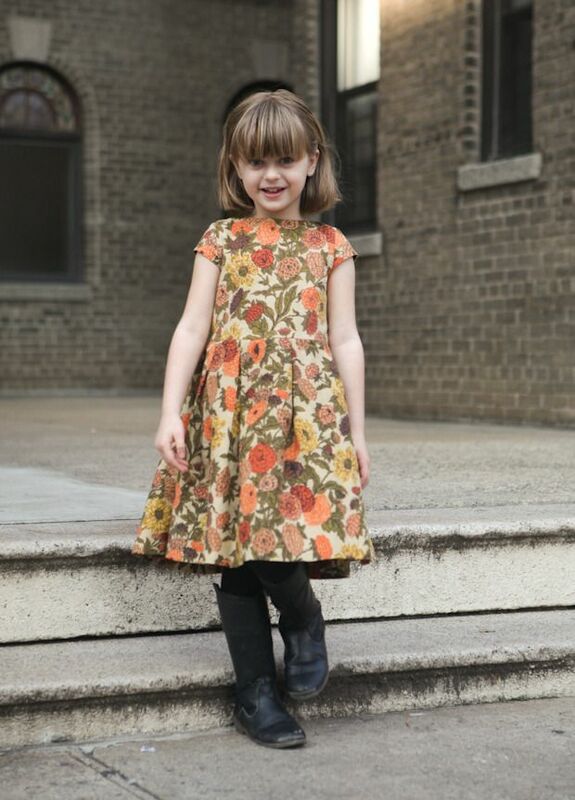 And the dress (and your daughter) are simply charming! Love it! I could definitely see this print looking ace as a backpack or for other accessories. I think this is in the BEST Sound of Music tradition! I can see why you were attracted to the fabric. 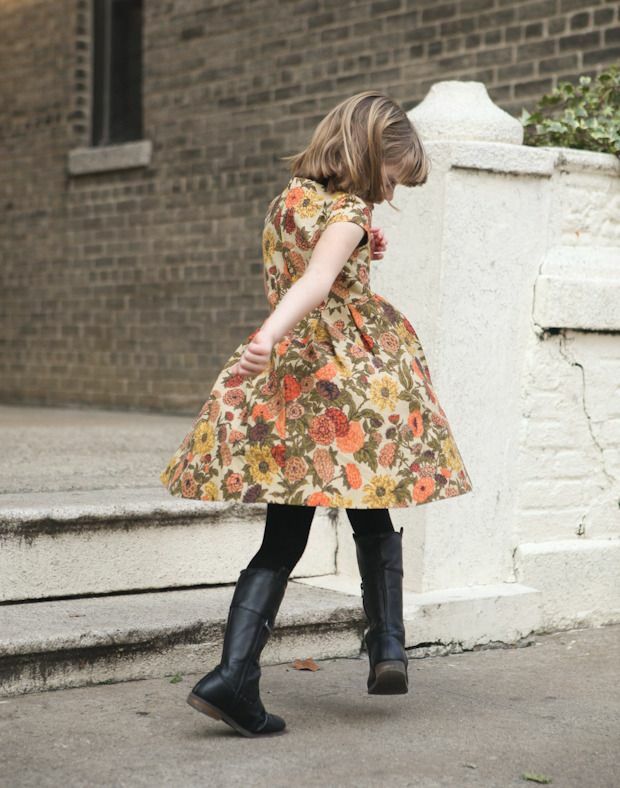 Honestly, I think you could make it into an adult tulip skirt to wear with boots/tights. Or what about a fun statement trench coat? This dress is adorable! I always look in my neighborhood but never find anything this delightful. Really great find, and cute dress! I love the idea of using the fabric for a bag, but you’ll still have loads left over – maybe a simple skirt? It’s very pretty! I’m pretty sure I’d be tempted to make myself a 60’s shift dress with the leftovers (would look amazing with your beautiful hair!). Otherwise a giant floor pillow would be fun! Eeee this is adorable! 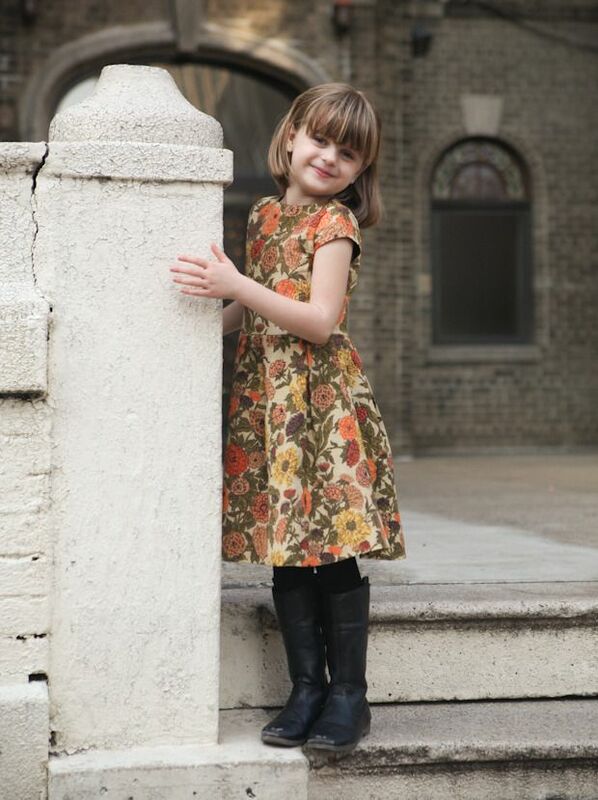 Definitely adorable as a kid dress, love that print. Your daughter looks absolutely adorable as always!! Great dress, and I think a duffle would be awesome! Oh it’s really cute girl photo! Love that shape and I’m sure it’s super cozy too. I’m obsessed with this dress! So, so cute! Make something for yourself with the rest- I love Clio’s suggestion of a trench!